A perfect gift for almond lovers and great to share at your next party. 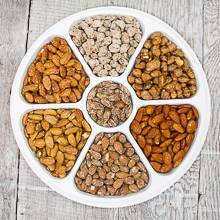 Includes Chili Lemon Almonds, Hickory Smoked Almonds, Butter Toffee Almonds, Cinnamon Honey Almonds, Tequila Almonds, Tamarindo Almonds, and Honey Roasted Almonds. 32 ounces packaged in a round tray. From Anonymous of San Jose, California on 6/6/2017 . 12/24/2013 – i wanted to know if there were sugar in any of the flavoring and witch ones if so.